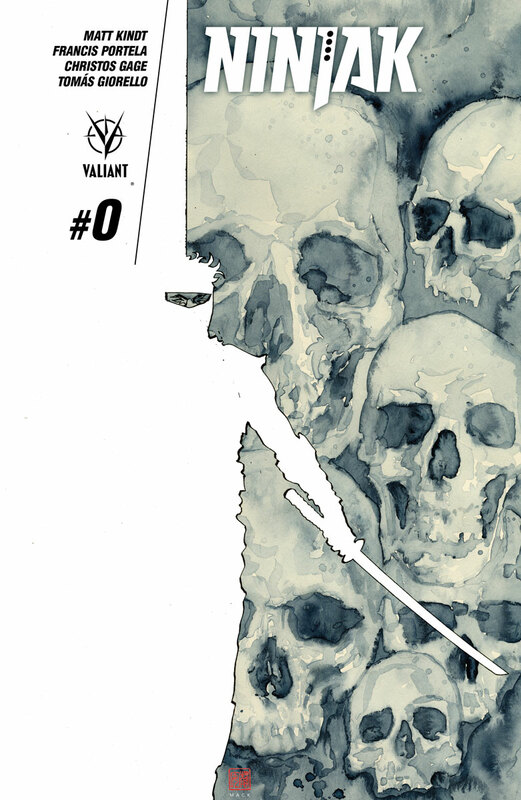 Valiant is proud to present your first look inside NINJAK #0 – a 40-page jumping-on point cutting deep into the life and times of the Valiant Universe’s most dreaded super-spy! On September 13th, go behind the mask of MI-6’s international intelligence operative as New York Times best-selling writer Matt Kindt (X-O MANOWAR, Mind MGMT) and acclaimed artist Francis Portela (FAITH) reveal a shocking secret at the heart of Ninjak’s distant past…before acclaimed writer Christos Gage (Netflix’s Daredevil) and blockbuster artist Tomas Giorello (X-O MANOWAR) present a bloodied and brutal vision of his future with an exclusive prelude to NINJA-K #1, the FIRST ISSUE of the can’t-miss ongoing series beginning in November! But now…an unknown enemy is hunting and killing members of THE NINJA PROGRAMME one by one – and NINJAK is next on the list. Out of the aftermath of NINJAK #0, Colin King’s next mission begins in NINJA-K #1 – coming this November from razor-sharp creators Christos Gage and Tomas Giorello!